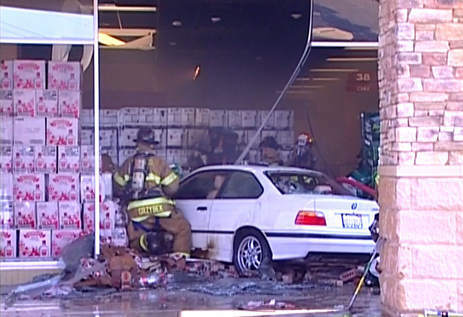 Retail Store Safety - Crash Prevention: You Mean Vodka Burns? A crash last week in Highland Park, Illinois, revealed a hazard I hadn't considered before. Usually, I'd be focused on someone getting hurt due to direct impact with a vehicle as it crashes into a building. In this instance, the lurking threat came from what was stored inside. Binny's Beverage Depot was stocked full of vodka, gin and similar products when a woman crashed her BMW through a display window, igniting a fire in the process. A Binny's employee reportedly rescued the driver from her burning car. I do not know how to post a photo along with this comment, but I have a shot of the car and the store after the fire. Pretty smokey stuff it turns out. People often forget that aside from obvious crash damage and injuries, severe structural damage and fire is not uncommon in these accidents.